Tommy and Charles have been living in San Antonio since 1997 — first in Terrell Hills, and now at La Cascada on the Riverwalk (it’s between King William and the heart of downtown). Tommy is a Texas boy. He grew up in Conroe TX, and comes from a long line of ‘Conroe-ians’. His parents, grandparents and great grandparents all grew up there. Tommy left Conroe to attend college at Sam Houston State University in Huntsville where he majored in accounting. After graduating, he went to work for Zales Jewelers and spent many years working for the retail establishment, moving to different stores during his tenure. He worked in management positions in the Huntsville, Palestine, and Houston stores, earning recognition as Zales’ top manager in the US for three years running. Charles was born and raised in Pine Bluff Arkansas, and left there to attend the University of Arkansas in Fayetteville, where he majored in biology. After graduating, he moved to Houston and took a job with Southwestern Bell Telephone Company, starting in a junior level management position and working his way up. Charles and Tommy met at a restaurant in Houston in 1984 (where they were both trying to educate a New Yorker about southern cooking), and have been together since. They moved to St. Louis in 1989 for a job transfer offered to Charles. Tommy quickly found employment with ADT Security systems. After a few years, Tommy left ADT to work for Cable and Wireless, which meant Tommy and Charles were working for competing organizations. In the 1990’s Southwestern Bell moved its headquarters from St. Louis to San Antonio, and in 1998, Charles and Tommy relocated here. They bought a home in Terrill Hills, and Tommy spent the next seven months working on the house. In early 1999, Tommy accepted a position with Southwestern Bell , and is still there today (although today, it’s AT&T). 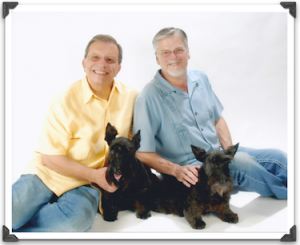 After 29 years with the organization, Charles took an early retirement and went to work for Neustar, based in Sterling VA.
Tommy and Charles share their home with their beloved Scottish Terriers, Freddie and Paris, and they love spending time with their four-legged family members. They enjoy traveling, especially to Europe. In the past few years they’ve been to Paris, London, Rome, Athens, Istanbul, Madrid and Barcelona. They hope to visit Prague soon. They enjoy good food and libations, and frequent several Southtown and Downtown spots, including Liberty Bar, The Palm, La Frite, Titos, Bliss, and El Mirador. They also both know their way around the kitchen. Charles enjoys preparing gourmet cuisine, while Tommy prefers expending his culinary talents on good ol’ comfort food. Over a year ago, a friend brought Charles and Tommy to the Lavaca & Friends Happy Hour, and they have rarely missed our weekly get-together since. They love the Southtown vibe, and are Lavacans at heart. Next time you see them at Liberty Bar, stop and say hello! Originally published May 22, 2013, in the Lavaca & Friends Happy Hour update.